In honor of CPE Bach's 300th birthday, hänssler CLASSIC will be releasing an exciting series of recordings dedicated to the music of this well known but hitherto neglected Bach son during the first 3 months of 2014. 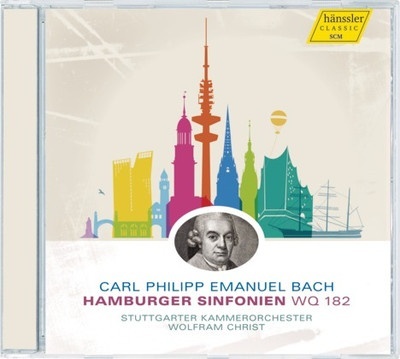 At the beginning there are the so-called “Hamburg” symphonies Wq 182, interpreted with great sensitivity and bite, when necessary, by the Stuttgart Chamber Orchestra under the renowned conductor and former violist of the Berlin Philharmonic, Wolfram Christ. Maestro Christ sees these works as expressive pieces, open to multiple interpretations that invite the listener to experience them as almost Romantic in their gesture and content. Deciding on a fortepiano continuo instrument is not only a historically informed decision, but contributes to a perfectly balanced overall sound.